There are so many elements in a chart which can be changed in so many different ways. The question is, which menu (tab) to choose for what purpose? You may not have thought about it before, now is a good time to understand this. Anything which talks about the WHOLE chart is there in Design tab. Anything which changes one of the elements of the chart is in the Layout tab. Axis, labels, series, etc. In the new version, all options under Layout were added to the Design tab. Finally, everything in a chart is just a shape. So if you want to customize anything like a shape – background color, border, shadow, font, etc. then use the Format tab. Efficiency is not about the features you know. It is about the mindset with with you approach technology. Here is a list of 16 articles I have written about the concept and its application. We work for 8 hours every day. Here is a different way of classifying the work we do. Efficiency improvement must happen with both types of work. In our busy lifestyle, we are always looking for Tips and Tricks. That is called HOW approach – which is spoon feeding. I prefer the WHY approach – which creates knowledge. Read on to find out the difference. Read on to find out how real this problem is.And what to do about it. Skip the introductory part and scroll down to the section Inefficiency Benchmarks and follow instructions. In each of my posts, I have shown how work can be done more efficiently. You probably already knew a method of doing it. I am highlighting the best, fastest, smartest method. That is called Efficiency. The problem is that there are millions of business activities we perform and there are thousands of features. I cannot help you with every activity you perform. 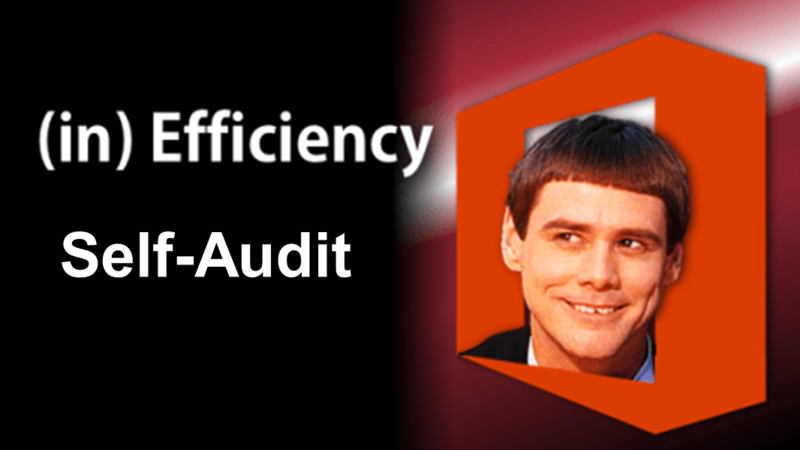 The question is, as an individual, how do you detect your inefficiency? The solution is simple. YOU must start detecting your own inefficiencies – while you work. How to do that? By a simple process of SELF-AUDIT. Start noticing how you work and think about what are the exact steps you are taking. Usually, while working with Office tools, we do not notice the actual steps. We have been using it for years. So things happen automatically. Self-Audit means consciously noticing the activities you perform. Click, Right click, Keyboard shortcut, mouse movement, repetition, Undo… everything. Initially it will require some proactive effort. But soon it will become a habit. Next problem: How to find if my method is inefficient? This is a tough question to answer. Because, in most cases you know only ONE method of performing the activity or task. Office allows you to perform most activities in many different ways. You found one method which worked for you and you stick to it lifelong. How did you find that particular method? Most probably by trial and error. Even if you found that method from documentation or research, there is a good chance that Microsoft has added more features to make it simpler. You have not taken any extra effort to find a better approach because your existing method is working anyway. This is what I called Active Inefficiency! If you know only one method, how can you say it is good or bad? Efficient or Inefficient? You have nothing to compare it with. No benchmark. The method which was best on day one may be the worst way of doing it today. Here are simple benchmarks to tell you whether your method is inefficient or efficient. These may sound arcane at first. But just try these for next few days. I will post more explanatory articles later. This is obvious. But still we continue to do many repetitive activities instead of trying to find a better way. If you are struggling and fighting with the software to get something done, then it is definitely not the right way – even if it eventually works. You try something. It works but it does not work elegantly. Are you trying to help Office? If yes then STOP IMMEDIATELY. Remember that Office is created to help us. Not the other way. So if you are faced with a situation where you are helping Office do its job, that means you are not communicating correctly with the software. Stop and try to find a way of communicating correctly. Content is important. Not formatting. But most of us spend disproportionately more time on formatting Word and PowerPoint documents. That is inefficiency. Content comes from brain. Formatting comes from hands. So an imbalance between usage of hands v/s brain indicates inefficiency. This is a corollary to repetition. Even if you use an inefficient method few times, it does not matter. But if the data becomes bigger, that inefficiency is going to take inordinate amount of your time. This is a sure way of detecting inefficient approach. If you made a mistake and pressed UNDO, then it is absolutely fine. But in reality, we often use UNDO because you tried to do something (intentionally) and what happened was not what you expected. Therefore, to repair the damage we use UNDO. This type of UNDO usage is a sure indicator of inefficiency. In this case UNDO is telling you that you don’t know how to do! Again it is time to discard your current method and find a better one. Try these benchmarks while working in the next few days. Post your feedback as comments. In future articles, I will cover examples so that you can relate to it better.